Furniture pieces are integral part of any household. Besides adding comfort to your living, they pass a style statement too. And undoubtedly we spend a fortune to procure the best pieces, both in terms of style and comfort. Though we take utmost care to keep them intact and safe, furniture removalists in Canberra is one job that puts them at high risk of damage and loss. Scratches, broken parts and lose hinge joints; a removal can be highly damaging. But relying on the proficient services of removalists Canberra can make all the difference. The expert crew of furniture removalists in Canberra handles furniture pieces with the utmost care and competency. Packing: The safety of the furniture pieces during transit is grossly dependent on its packing strength. Belongings that are deftly packed are sure to reach their destination intact. But packing is not just about wrapping belongings in a cover. Knowledge of the type of packing material to be used, the quantity of the material required and the style of wrapping are of paramount importance. Dismantling: Not all furniture pieces can be moved to their original shape. Dismantling them to smaller pieces that are comfortable to handle and manage is important. Coding and Labeling: Simply putting the belongings in a box may not be enough for a hassle-free and safe move. Adept coding and labeling of boxes is important for effective loading, unloading, and unpacking of items. Loading and Unloading: It requires skill, tactics, and techniques to load and unload heavy furniture pieces. As expert furniture removalists Canberra we are equipped with the best removal gear and use best techniques to load and unload furniture competently. Reassembling: Dismantled furniture pieces should be reassembled competently to ensure that their comfort and usability match with the original. Superior reassembling skills are therefore important to bestow the best results. Rearranging: It’s not possible for family members to arrange the heavy furniture pieces. Also, dragging and lifting heavy items may hurt self and damage furniture. 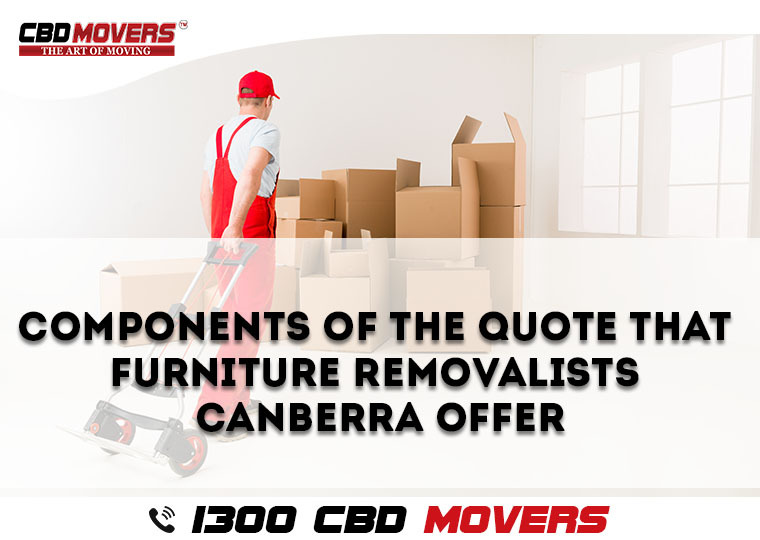 As a part of our end-to-end deal, our removalists Canberra arrange the furniture pieces at their desired location, thus saving you from the effort and hassle of rearranging heavy pieces. At CBD Movers, we staff the most proficient men in the business. Their comprehensive knowledge and industrious nature help you enjoy the best furniture removal in Canberra. Get in touch with us for superior deals at affordable rates. Previous PostPrevious How Office Movers In Adelaide Make Moving Easy?